STM (STORM MOTION) is the average wind speed in knots a storm will move and the direction the storm will move from. 2. How is STM determined? The storm speed is calculated as 75% of the mean wind speed between the surface and 6 km. The storm moves slower than the ambient wind speed since a storm has a large mass of water that has to be pushed along. The turbulence within a storm also makes it more difficult to push along. Storms will move more quickly in cases where there is speed shear with height (wind speed increases with height). 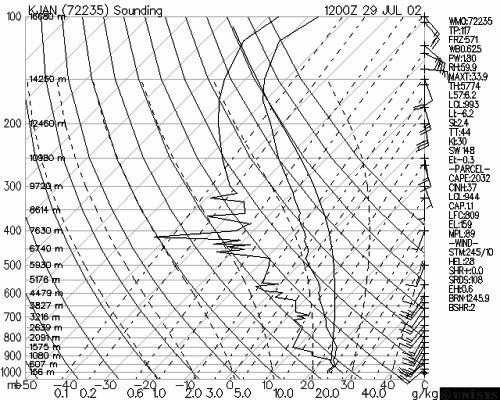 The sounding at the bottom shows a STM value of 245/10. The 10 is the wind speed of 10 knots. This is a fairly slow motion since the wind speeds are light in the middle troposphere. The storm motion is given as the compass direction from which the storm will move from. The meteorological compass has 90 degrees being a wind from the east, 180 degrees being a wind from the south, 270 degrees being a wind from the west and 0 degrees / 360 degrees being a wind from the north. The storm motion is determined as a 30 degree veer from the average surface to 6 km wind direction. Strong storms will veer (move to the right of the original path of motion) due to storm dynamics. The sounding at the bottom shows a STM value of 245/10. The 245 is the direction the wind is coming from-- west south wind. The storm will be moving from the WSW once it matures. STORM ANTICIPATION- Gives insight into which direction supercells and tornadoes will move from on days in which supercell thunderstorms are favorable. a. Misses mesoscale processes that may alter storm motion.